Download a complete version of the policy. and employees responsible for hauling away waste that is generated in UNC-CH research laboratories. North Carolina medical waste rules (15A NCAC 13 B .1200), require that “Regulated Medical Waste”, defined as “blood and body fluids in individual containers greater than 20 ml, microbiological waste, and pathological waste,” must be treated before disposal in order to render the waste nonhazardous. Most UNC-CH campus laboratory-generated biohazard waste, as defined below, falls under the State defined category of “microbiological waste” within 15A NCAC 13 B .1200. Biohazard waste generated and collected in UNC-CH research laboratories is to be properly autoclaved according to procedures outlined below. This process changes the biological characteristics of the waste thereby reducing or eliminating its potential to cause disease. Laboratories with biohazard waste not specifically addressed by this document (such as waste with multiple hazards, e.g. radioactive biohazardous waste) should consult with Environment, Health and Safety for alternative treatment and disposal methods. The procedures of this policy are consistent with applicable sections of the OSHA Bloodborne Pathogens Standard 29 CFR 1910.1030. Materials contaminated or potentially contaminated during the manipulation or clean-up of material generated during research and/or teaching activities requiring biosafety level 1, 2, or 3 or animal or plant biosafety level 1, 2, or 3. Refer to your laboratory’s Biological Hazards Registration section of the Laboratory Safety Plan (Schedule F) to identify these materials in your lab. Human liquid blood and body fluids. Human tissue and anatomical remains. Materials contaminated with human tissue or tissue cultures (primary and established) because these are handled at BSL-2. Animal carcasses, body parts, blood, fluids and bedding from animals infected with BSL2 and BSL3 agents. Blood and body fluids (Regulated medical waste) Treated with bleach or autoclaved and put down the sanitary sewer. Microbiological Waste including Biosafety Level 1, 2 and 3 organisms: (Regulated medical waste) Autoclaved at 121°C. (Autoclaves are tested weekly using bioindicators Geobacillus stearothermophilus) or chemically treated and put down sanitary sewer.Please note: The NC Medical Waste Rules do not allow chemical disinfection of regulated liquids followed by disposal to the sanitary sewer unless approval has been obtained from the NC Division of Waste Management. Refer to the chart below for a snapshot of the four most common biohazard waste collection methods. This chart is also available full size. These methods are described in greater detail further down the page. For contaminated animal carcasses, body parts, and bedding, refer to that particular section in this guide for disposal guidance. Biohazard waste originating from designated BSL-2 or greater containment areas must be indicated on the Biological Hazards Registration section of the Laboratory Safety Plan (Schedule F). 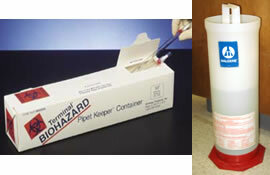 In UNC-CH research laboratories, biohazardous sharps are collected directly into red, plastic containers available from FisherScientific (stock # 14830124 for contaminated, 1482664B for non-contaminated). These containers must bear the biohazard symbol marked with an “x” using autoclave indicator tape. Federal OSHA regulations (CFR 1910.1030) require biohazard laboratories to minimize their use of sharps whenever possible and that needles not be recapped, purposely bent, broken, or otherwise manipulated by hand. To avoid accidents related to overfilling the containers, remove the containers for disposal when they are 2/3 full. When removing the sharps container from a biosafety cabinet, always decontaminate the exterior of the container. 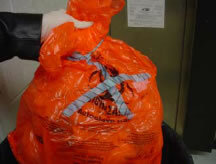 Containers of sharps contaminated with biohazardous materials should be autoclaved in an orange autoclavable bag marked with an “x” over the bag’s biohazard symbol. After autoclaving, the bags with the containers of sharps can be disposed of with the regular trash. Non-hazardous sharps should be placed in the white plastic sharps containers. 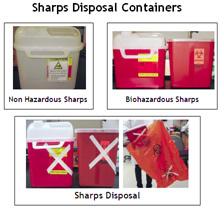 The non-hazardous sharps containers should be disposed of in regular trash once they are 2/3 full. While small shards of contaminated broken glass can be placed into the sharps containers identified above, large contaminated broken glass items must be autoclaved separately in a hard-walled container (such as a cardboard box) lined with an orange biohazard bag bearing an autoclave tape indicator “x” over the bag’s biohazard symbol. Place the tape on the orange bag before it is used to line the box to prevent contact with biohazardous materials and sharps. The universal biohazard symbol should also be found on the outside of the box. After autoclaving, the glass waste can be disposed of in the regular trash. DO NOT enclose the cardboard boxes used for gathering sharps/glass within an autoclave bag. This will prevent steam penetration during autoclaving. Steam penetration is crucial during the decontaminating process. Remember to line the boxes with an orange autoclave bag marked with an “x” over the biohazard symbol before lining the box. For large-scale collection outside the biosafety cabinet of Glass (Pasteur) and plastic pipettes contaminated under the definition of biohazard waste, line a puncture-resistant outer container (such as the box the pipettes came in) with an orange autoclave bag marked with a heat sensitive autoclave tape “x” (available from FisherScientific as stock number #15-903) over the biohazard symbol. To avoid possible exposure, place the indicator tape “x” over the bag’s biohazard symbol prior to loading the bag with pipettes. The universal biohazard symbol must also be displayed on the outer container. When the box is full, close the inner bag leaving an opening for the steam to penetrate. Tape the outer box closed with autoclave tape. Do not use colored tape to close box. For frequently removed small scale collection, such as sterile pipetting in a biological safety cabinet, line a small orange autoclave bag inside a hard-walled collection container inside the cabinet. When the bag is 2/3 full, close it loosely, spray with proper disinfectant and transfer it to a larger scale pipette collection container located outside of the cabinet.Another alternative for collecting biohazardous pipettes is to place them in a long, hardwalled cylindrical container filled with an effective disinfectant. The pipettes should be allowed to remain in the disinfectant for the recommended contact time to ensure decontamination.On the benchtop, pipette tips are to be collected in a small autoclave bag lining a wire stand or other container bearing the biohazard symbol. When 2/3 full, loosely close the bag to allow for steam penetration, spray with disinfectant and place with other solid biohazard waste. The outer collection container must be durable, leak proof, have a lid and be of such a design so as not to be mistaken by Housekeeping as regular trash. This container must be labeled with a biohazard sticker. Wire cages cannot be used as the outer container. 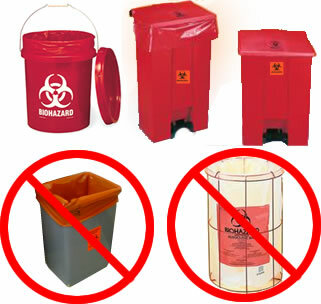 In addition to the requirements that biohazard waste containers must be durable, leak-proof, have a lid, and be clearly labeled, all UNC laboratories are required to collect biohazard waste in outer containers that are red. This policy also puts a maximum limit on the size of a biohazard waste container at 15-gallons (57-L). Biohazard bags must be orange in color. Fisher Scientific carries orange autoclave bags that vary in size; contact the campus representative or for further details. as stock number 15-903). The lid should be kept on the biohazard container when not in use. Remove bags at 2/3 full. Never place glass or sharps in these containers. Animal blood/body fluids from animals infected with BSL2 and BSL3 agents. Autoclaved liquid wastes may be discharged directly to the sanitary sewer. Liquid waste media from cells/tissue used for propagating risk group 1, 2, or 3 pathogens or toxins, including those produced in recombinant DNA procedures. “Microbiological waste” as defined by the North Carolina medical waste regulations: e.g. cultures and stocks of infectious agents. If you wish to obtain approval for chemical treatment of infectious liquids, you must provide information demonstrating the effectiveness of the chemical being used to treat the specific microbiological agents, taking into account factors such as temperature, contact time, pH, concentration, penetrability and reactivity of organic material. All requests for approval must be submitted to the NC Division of Waste Management through EHS, and documented in the Lab Safety Plan under Schedule F (Biological Hazards). Visit the EHS Chemical Treatment of Liquid Microbiological Waste page to evaluate if chemical treatment of your liquid biohazard waste requires approval. The primary and secondary flasks should contain a 10% bleach solution. The flask solution should be changed at least once a week to insure the killing strength of the bleach solution. Flask waste solution can be disposed of down the sink drain only after all potentially infectious material has had at least 20 minutes of contact time. NOTE: If using a disinfectant other than a bleach solution, it may not be approved for sink disposal and you should contact the Biosafety Section at EHS (919-962-5507). An alternative to autoclaving Drosophila is dumping anesthetized flies directly into a container with a small amount of mineral oil or a bottle containing either ethanol or isopropanol. If you do not plan to re-use the material, these bottles must be labeled as ethanol, isopropanol or mineral oil waste to be picked dup by EHS. If you are going to reuse the material you are dumping the Drosophila into, then you will label the bottle recycled ethanol, isopropanol etc. These bottles of chemicals cannot be poured down the sink or sanitary sewer. They must be discarded using the online hazardous waste pick up program through EHS. You can find the form online. Animal carcasses are disposed of through the Department of Laboratory Animal Medicine. Animal carcasses, body parts, and bedding from animals inoculated with infectious agents, are disposed of by incineration. These materials are to be placed in boxes provided by DLAM and marked for incineration. (No needles or other type of metal and no PVC plastic are to be placed in the collection boxes. Use only non PVC plastic bags.) Carcasses contaminated with radioisotopes or carcinogens are picked up by the Department of Environment, Health and Safety. Recognizable human anatomical remains or tissues and large tissues must be disposed of by incineration. Remains contaminated with hazardous chemical or radioactive sub stances require special disposal and EHS must be contacted for disposal. Unrecognizable human tissues can be autoclaved and disposed of in regular trash. If the tissues have been chemically preserved, they can be disposed of as chemical hazardous waste. Contaminated materials should never be left in hallways or other public spaces prior to autoclaving. Biohazard bags should remain in the laboratory until they are ready to be placed in the autoclave. Never leave bags sitting on the floor next to the autoclave.. Bags that are closed and ready for autoclaving must be placed in secondary containment as shown. If the bags are being transported to the autoclave, they must be contained in closed, hardwalled secondary containers. Minimize contact with biohazard waste as much as possible. Never crush or push down biohazard waste, Biohazard waste containers should be removed for autoclaving when they are 2/3 full. Indicator tape should be applied when placing the new autoclave bag into the hard-walled outer container; this will reduce handling of the biohazard waste during removal. The heat sensitive autoclave tape should be placed in an “X” pattern over the biohazard symbol. The heat sensitive tape is to be of the type that changes color, such as the type that stripes appear on after treatment. This tape is available from Fisher Scientific as # 15-903. Once the autoclave disinfection is complete, the tops of the bags may be sealed tightly with lab tape. 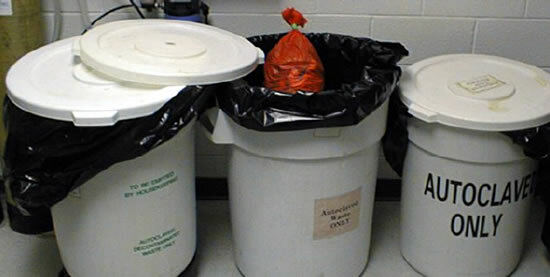 After the proper autoclave waste decontamination steps are followed as listed below, the decontaminated waste is then placed in a 44 gallon or 32 gallon white Rubbermaid Brute container (with a drum dolly), lined with black plastic garbage bags, and located in the vicinity of the autoclave. These containers are to be labeled “AUTOCLAVED/ DECONTAMINATED WASTE ONLY” (labels). Biohazard bags placed in the white Brute containers and marked with the heat sensitive tape signal to Housekeeping that the waste is safe and ready to be removed from the laboratory for disposal in the dumpster. Each department is responsible for providing an adequate number of these containers which are available from the Fisher Scientific. Housekeeping will not remove or otherwise handle overflowing waste or waste in untreated biohazard bags. Autoclaving, or steam sterilization, is the most dependable procedure for the destruction of all forms of microbial life. Proper temperature and exposure time are critical factors in ensuring the reliability of this method. These critical factors are dependent upon steam penetration to every part of the waste load. Therefore, the autoclave user must be mindful to prevent the entrapment of air. If all the air is not allowed to escape from the waste during the cycle, it cannot be replaced by steam. Saturated steam is employed under pressure (at least 15 pounds per square inch) to achieve a chamber temperature of at least 121 C (250 F) for a minimum of 15 minutes. This time is measured after the temperature of the steam saturated material being sterilized reaches 121 C.
Become familiar with the autoclave’s owner’s manual. Though the principle is the same for each, manufacturer recommendations for use can vary widely. Firmly lock autoclave doors and gaskets in place before you run the autoclave to prevent a sudden release of high-pressure steam. Some autoclaves do not have safety interlocks that prevent the autoclave from running if the door isn’t closed properly. If your autoclave does not have safety interlocks, you will need to take additional precautions to ensure that the doors are closed. If you have an older autoclave that has little or no heat shielding around the outside, attach signs warning of “Hot Surfaces, Keep Away” on or next to the autoclave to remind people of the hazard. Do not stack or store combustible materials (cardboard, plastic, volatile or flammable liquids, compressed gas cylinders) next to an autoclave. Do not autoclave toxic, volatile or radioactive material. If you have biohazard waste that contains any of these materials, please contact EHS for guidance. When a cycle is complete, wait approximately 1-2 minutes after the pressure gauge reads zero before opening the door of the autoclave. Wait at least 30 seconds after opening the door before reaching or looking into the autoclave. Open the door slowly, keeping head, face, and hands away from the opening. Allow contents to cool before removing them from the autoclave. Remove solutions from the autoclave slowly and gently; some solutions can boil over when moved or when exposed to room temperature. Thick, heat-resistant gloves, safety goggles or face shield and a rubber apron must be worn when removing hot liquids from the autoclave. Liquids should stand for over 1 hour before being handled without heat-resistant gloves. Report any malfunctions or accidents immediately to your supervisor. All employees that use an autoclave must complete the online autoclave training. To ensure that infrequent users do not neglect proper operating techniques, autoclave operating instructions should be posted in close proximity to the autoclave. The autoclave is to be operated at 121°C (250°F) or higher for a minimum of 60 minutes for most biohazard waste (see chart below). The time and temperature used for each type of waste in the laboratory must be validated using biological indicators to ensure effective sterilization (see procedure below). Some autoclaves are equipped to operate at higher temperatures, which would allow for shorter exposure times. Use the appropriate autoclave settings. Autoclaves may have settings for “LIQUIDS” to be used for liquid materials. “LIQUID” settings run for longer periods at lower temperatures to minimize liquid evaporation and spills. For solid materials, the “DRY GOODS WITH VACUUM” should be used for infectious waste as it is the most effective at moving steam and heat into the deepest parts of large bags producing the best conditions for killing persistent organisms. “DRY GOODS WITHOUT VACUUM” should only be used for clean items that need to be sterilized. Exhaust settings should also be appropriate for the type of waste being autoclaved. FAST exhaust should be used for solid items and SLOW exhaust should be used for liquids. Solid waste. Do not overfill waste bags or the autoclave. This will interfere with steam penetration. Add about 50-100 ml (~¼ to ½ cup) of water to each bag of solid waste to facilitate steam penetration in the bag. If there is naturally occurring water in the load, adding additional water is not necessary. Keep the waste bags slighty open to allow for steam penetration. Bags are placed into stainless steel or polypropylene trays prior to autoclaving. Liquid waste. Liquids should be placed in borosilicate (Kimax or Pyrex) or polypropylene containers for autoclaving. The containers should not be filled to more than 75% capacity. The caps or stoppers on the containers should be loosened. Never autoclave sealed containers of liquid. This could result in an explosion of superheated liquid. Liquid containers should be placed in a stainless steel or polypropylene tray with ¼ to ½ inch of water in the bottom of the tray. The tray should be placed on a shelf in the autoclave and not on the bottom of the chamber. N.C. medical waste rules state that autoclaves are to be provided with a chart recorder which accurately records time and temperature for each cycle. The N.C. Medical Waste Rules require that autoclaves be monitored under conditions of full loading for effectiveness weekly through the use of biological indicators. Geobacillus stearothermophilusindicators must be used with average spore populations of 104 to 106 organisms. There are many commercially available biological indicators with a choice of spore ampoules or spore strips with growth media. Follow the instructions provided by the manufacturer of the biological indicators. Most require refrigeration when kept in storage. Place the indicator in the middle of the waste bag or material to be autoclaved. It is best to put the indicator in the waste bag before it is filled completely. To aid recovery of the indicator after sterilization, tape it to a brightly colored sheet of paper or to a long string allowed to protrude from the bag. Indicators can also be placed in test waste bags filled with materials that simulate full loading for the test. Autoclave the waste following normal procedures. Once the cycle is complete and contents have cooled, remove the indicator from the waste bags wearing appropriate protective equipment. Prepare and incubate the indicator and a control indicator that was not autoclaved as recommended by the manufacturer. Check for signs of growth at regular intervals during the incubation period (8, 12, 24 and 48 hours). There should be signs of growth on the control indicator that was not autoclaved or the test is invalid. If there are signs of growth on the indicator placed in the waste, the waste was not sterilized properly. The time, temperature and autoclave procedures should be re-evaluated. If an autoclave problem is suspected, Facilities Services must be contacted immediately for repair. A log of each test should be maintained, which includes the type of indicator used, date, time, and result of the test. An autoclave testing log is available for download. The waste does not have to be held until the results of the testing confirm effectiveness. If test results indicate that the autoclave is not sterilizing properly, the autoclave should not be used for waste until it has been repaired. The first load run in the autoclave should be tested with a biological indicator to insure proper functioning of the autoclave. Remove the plug screen or drain strainer to make sure it is free of dirt, dust, or sediment that may collect in it and it should be cleaned as necessary. Clean the interior surfaces of residues collected from the steam or materials being sterilized as needed. Visually inspect the gaskets, doors, shelves and walls for residue buildup or wear regularly. Report any problems with your autoclave to Facilities Services.